Redblade CG focus on fast, easy and clean character generation. Prepackaged with full SRD support, easily adepts to new roleplaying systems. License allows commercial use for Publishers. Comprehensive campaign, sourcebook and charactersheet Designer. Create fully fleshed out characters in under 10 minutes. Export your character sheet to HTML. Prepackaged with SRD rules, including Core rules, Epics, Psionics, Divine. No scripting or text file editing required! Drag- and drop character sheet design. Integrated Sourcebook Designer with makes sourcebook entry a breeze. Contains extra facilities to keep track of your data entry progress. Data can be easily re-used. One click installer generation allows for easy publication of your creations. 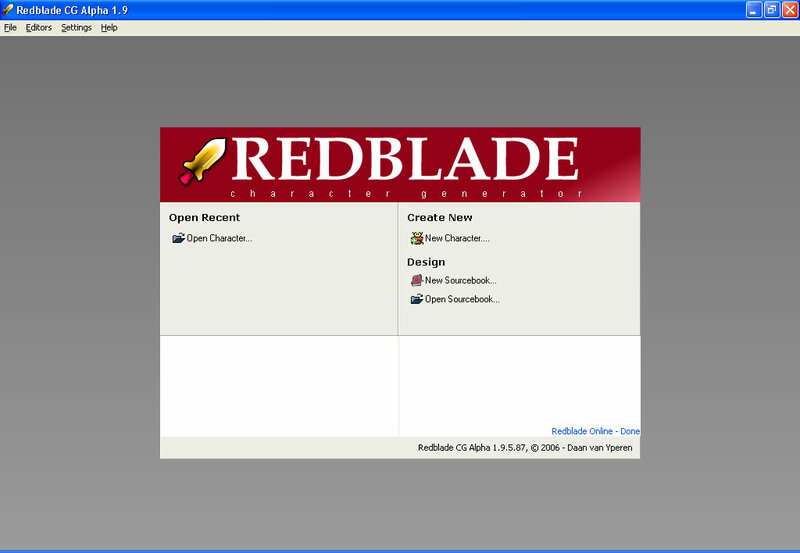 Include a theme to integrate Redblade with your publication. Provide sourcebook upgrades from your website via an RSS link. You are allowed to sell Redblade Sourcebooks/Campaigns of your publications. You are allowed to distribute Redblade CG with your publications. Translation into Dutch, German, French, Spanish and many other languages. Exporting your character sheets to PDF/OpenOffice/Word/XML and other formats. Customizable Statblock generation in various formats. API to integrate Redblade CG in your products.